That of course begs the question of what exactly this DLC will be? Despite only having some very restricted information there is no shortage of theories and speculations if one were to take a cursory look at Youtube or certain forums. With all those different theories based on so little information it may sound mad to try to come up with an even better one. Which is precisely why I will not do that and instead talk about something completely different here. There are enough ideas out there, I am willing to wait until the DLC drops. But there is another topic that needs addressing. It is at this point commonly accepted that BotW is not only a sure-fire Game of the Year, but pretty much the new status quo when it comes to open world games. 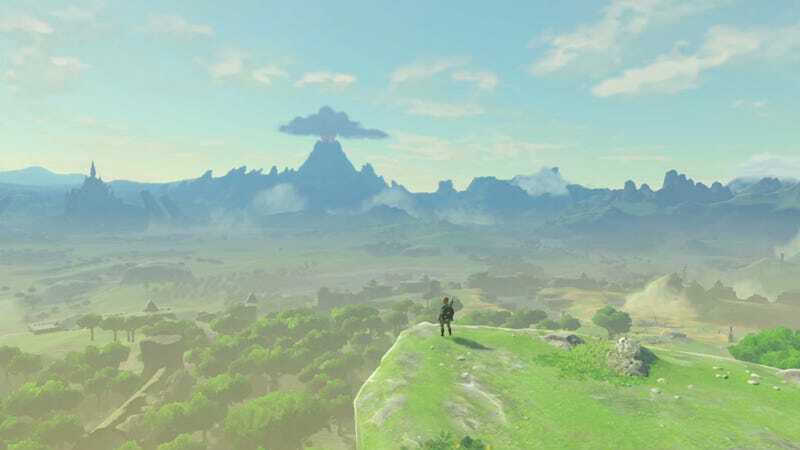 From this point on, every new open world game will be compared to Breath of the Wild and prove that it learned from it, which is exactly what I want to talk about: What can, and SHOULD other games learn from Zelda and why do these things matter? Yes, there will be spoilers, mostly for Zelda but also for some other big open world games. Also, I will try to avoid simple or very broad answers, like “Just make it bug-free” or “Make it more fun”. Neither of those are actual answers or helpful in any way. Lastly, I will use the Assassin’s Creed games as a counter-example a LOT. This is not because I hate those games or think them to be bad. I actually like them quite a bit and therefore have played them pretty often, so I have the biggest possible amount of knowledge about them when it comes to open world games. Also also, I recently replayed AC 4 Black Flag and couldn’t help but comparing it to Zelda. Just keep in mind, I am not trying to bash the AC games or Ubisoft games in general, they just happen to be a very convenient example currently available to me! All the bigger was our surprise when we played the game only to realize: Yeah, actually, those work great! They are fun, they are interesting, they are challenging, they are… everything that Ubisoft has failed to deliver over the years. They are Memorable. Instead of just copying the same template again and again, Nintendo made sure each tower is unique in its own way. There is the one that’s being guarded by a ton of stationary Guardians, the one encased in Ice, the one coming out of a bottomless chasm, the on covered in thorns, and so on and so forth. The point being: Each one is memorable and unique for their own reasons. If you played the game you probably are remembering some of them right now as well, right? The only Assassins Creed tower I can remember well is the one atop the Duomo in AC 2, mostly because I played that game half a dozen times and it was the first tower I ever climbed, a task that promptly cost me an hour or so because I hardly knew how the climbing system worked back then. Another big point here is that they aren’t all that many of them. It feels like many, but if you think about it, its a joke compared to then numbers we usually see in AC or Far Cry. And this is good, because, together with their own unique selling points, it stops the towers from being just number 23 out of 42. They feel like a whole lot but are few enough to remember each one. Some games, like Watch Dogs, have tried making their towers memorable with some basic riddles that need to be solved to access them, in the latters case some camera jumping and lock-hacking. Unfortunatly these attempts ended up linear and finally repetitive, bringing me to the next point. We got flexible methods in climbing. The second big part in how those towers got so good is the different possibilities we have when it comes to climbing them. We can try to just climb up and use the platforms the tower gives us. But some towers don’t have any, or they are blocked by goop or thorns, or we are attacked all the time. We also could use fire to create an updraft or glide from a high location. We could stock up on Stamina potions and similar items and equip our climbing gear and just brute force it. The point is: We have the freedom to pick our own approach to the tower instead of following the obviously prepared path. It helps that the climbing system itself is much deeper and more interesting than everything Assassin’s Creed produced over the last years. Towers worked like actual Towers. This is probably the biggest part. Instead of thinking about some complex explanations for icons and waypoints suddenly showing up, Nintendo just decided to not do any of that and leave the towers be. Instead of vomiting random symbols all over our map, the Towers in Breath of the Wild are just that: Towers. You know, high structures that are build to observe the surrounding terrain? You actually can and have to look on your own, using the Towers as vantage points to find points of interest in the world. More importantly: you actually find points of interest in the world! Imagine for a second an Assassin’s Creed game without the Icons. Even from the towers, you would not be able to find all that much. Everything looks equally interesting or boring, depending on where you currently are. In Zelda however, Towers and other high places actually help you find things! It can be argued that part of this is due to different types of game worlds and objectives, but that is no excuse to not at least try to do a better job at designing a game world and points of interest in it! The fact that I can actually spot an interesting landmark in the distance and go there instead of having some icon pop up and guide me to a point I never could have seen in the first place, is huge! Far Cry 3 attempted something better by having quick camera flights to unlocked locations, but the shift in the viewpoint and the quick execution turned into more of a spectacle than anything actually helpful. Being able to go towards that interesting thing in the distance. This kinda ties in with the previous two points, but a big part that makes those towers so easy to use is the fact that, as soon as you see something interesting, you can immediately go there! Just jump down and open your glider. You are not forced to use the obvious haystack placed at the bottom of the tower, or ride down convenient zip-lines, losing your line of sight to whatever interesting you just saw and completely disorienting you in the process. And even if you lose orientation, you probably placed one of those handy light pillars there, giving you the ability to find you destination without constantly checking the map! So all you had to do was to head for the next hill/tree/house/whatever climb up and take a look around. Maybe you even ended up finding something else that looks interesting! All of those points may sound small, but they make a huge difference, especially when they all come together. And that’s before we go any deeper in all the other mechanics and systems that the game uses! The point is that the towers in BotW feel actually alive and interesting, like the developers actually thought about how these should work and what purpose and function they should have. In the meantime AC towers feel like some mandatory element that is just slapped across the map in a vaguely grid-like pattern to make sure everything is covered and the number from the last game is topped so it can be used for braggy PR. If you ever start adding something just because that’s how it has always been, stop adding that thing, and start thinking, WHY it should be there and WHAT it should do. Maybe you could do much better if you just thought about it for a second. A lot of those icons are only there because the player wants them to be there. One of the funny details about BotW is, that, despite how huge it seems to be, it loses in most of the direct comparisons with games like The Witcher 3 or Skyrim. Did you know that there are less than 100 quests in BotW? Sure didn’t feel like it, did it? That’s because this game lets the player make their own quests and checklists, without the need for tables, completion-percentages and a sh*tton of icons all over the map. Instead the world is littered with interesting things to find, or hear about, or look at from the distance, or theorize about. It starts with the smaller details, like the fact that there is a Shrine close to every Stable. There is no list, no quest no nothing, but at some point the player just knows it and starts looking. Or the riddles that hide the Korok seeds. No two are the same, but they all follow similar patterns, making it easy enough to find them without the game having to spit some 900 icons all over our map (Looking at you AC Unity!). Oh, and fun fact: the game never tells you that there are 900. Same for the shrines, or chests, or nearly every other thing in the world. There is no percentage, no checklist, no number to compare against how few you have found and how laughably many are still left. Instead the game just checks what you have already done and lets you come to your own conclusions. Are 137 Korok seeds many? Don’t know, you decide! Without being constantly shown some totals that he needs to achieve, the player feels infinitely more comfortable going off-track and doing whatever he wants. But give a player a checklist, or some icons, or worse, both, and at some point he will just bee-line from one to the next without looking anywhere else. After all, this is obviously the stuff he is supposed to complete, most other things are probably not interactable or important anyway, right? If they were, they wold have gotten their own icons or checklists. So the player ignores everything else, which, in the worst case, can lead to him forgetting and missing the rest of the game world. That the city was breathtakingly beautiful. The game has a handful of major cities and locations, and all of them have some unique characteristics and looks, but returning to Havannah only to truly “see” it for the first time, without any icons or collectibles distracting me, absolutely blew me away. The southern, caribic flair, the colorful plants everywhere, the way the architecture ever so slightly reminds you of the Ezio-Trilogy, the tight layout of the city, with buildings being pressed against each other, all of it made me regret that the game spent so little time here. It made sense of course. I had completed everything there, what reason did I have to go back after the initial story segments were finished? In hindsight this had been happening throughout the whole game. Even now, several years after release, AC 4 is a beautiful game, even on my old trusty Wii U. There are some incredible locales, from lush jungles, over mysterious ruins, to spectacular waterfalls, and those are just the uninhabited islands. But the game is so busy leading us from one icon to the next, asking us to please find all those chests and collect all those fragments and hunt all those animals that the actual world easily gets lost in all of it. Even worse, this also robs the player of his freedom and independence, as he always feels the obligation to complete all those tasks on the list and find all those things marked on the map, and craft all these items in the menu, and so on and so forth. Those are the checklists that the game asks us to complete. Nothing else truly matters. This happens even during mission, with “optional goals” demanding certain routes or forcing our attention at one specific element. In Zelda this does not happen, simply due to the absence of this kind of checklists and tasks or “correct” ways to do it. They could have made every shrine a quest, or a giant list of all the Korok seeds, or constantly tell you exactly how many stables or towers you are still missing. Nearly all other open world games do. And yet Zelda surpasses them all by not doing any of this. Instead the game lets the player decide by himself what he wants to do or try next. I think all those who have played the game have already shared stories among each other about crazy discoveries and stupid experiments and incredible secrets. This starts as soon as the first tower or similar structure is scaled. There is no checklist of the number of shrines you’ll now be able to access or icons on the map to find them. You look out there and check out whatever looks interesting. And if you find something good, you just place your own icons on the map. This is the true genius of the game: instead of drowning you in lists and icons and whatnot, it encourages you to create your own, making sure everyone is able to get what they want. Some people hardly set icons. Others mark everything, from missed chests over bosses to rare equipment spawns. But they all have the choice and freedom to do so however they want, and that is what makes the experience so empowering and memorable. This also shows something else: Icons or Checklists aren’t bad per se, but like many things, there is too much of a good thing. The Ubisoft Open world games reached that point a few years ago and promptly became cold, mechanic affairs, made up of players rushing from one point of interest to the next. Zelda manages to set us free again, without us getting hopelessly lost. This is not easy to pull off (Xenoblade and Xenoblade X both struggled with it), but the results are sooo worth it! Come on. Did you really expect me to take any other image fo this? What do these things have in common: The buyable house in Hateno village, the Dragons of Hyrule, the ability to colour your clothes and the picture mode of the Shiekah Slate? Yes, they usually are introduced all around the same time, but that’s not the point. No, the important thing is, that we never knew about them before playing the game! They are all sizeable mechanics and elements in the game, and up to the point where we discovered them, we had no idea they even existed. Think back and try to remember when a big open world game, or any big game last did this, and actually hid features and mechanics from us. We live in a time where developers often go so far to spoil easter eggs and the like, and in the midst of it all Nintendo just kept their mouth shut. Not that they didn’t tell us anything. From the trailers alone we got veritable tons of hints, not to mention the hour-long E3 streams and the uncountable impressions from the people playing the demo. And yet, Nintendo kept sizeable parts of the game completely hidden, letting us discover them on our own. I am just gonna ask at this point, but what was your reaction upon climbing to the top of mount Lanayru only to find a huge friggin dragon wrapped around it? I can only talk for myself but I was utterly blown away. And I was blown away again, when I saw that there were other dragons, or when I was riding down the old Lanayru street/valley, only for the same goddamn dragon to suddenly fly directly above me! Finding out that these dragons followed patterns and that you could harvest rare materials from them was absolutely amazing, mostly because I had no idea that something like this was in the game in the first place! And things like this kept happening: Eventide Island, the Bloodmoon, Kilton and his monster shop, the ability to scale waterfalls, riding bears and deer and dead horses, and tons of other things! The point is: When you have games as huge as this, keep some secrets! Not just that one special achievement or easter egg for the people that 100% the game, but bigger parts or mechanics. Let us find and discover some things on our own. After all, that’s what open world games are supposed to be about, discovery! Also, going back to the previous point about checklists, don’t push it in our face as soon as we boot up the game. Again, let us discover those things at our own pace! Yes, I get it Assassins Creed, as soon as I find the five keys-ex-machina I unlock the cool, old armor, oh my, how could I have guessed! Question: What is wrong with this tree? Answer: No obvious branches to grab for the average video game protagonist! This is by far the hardest part. Not just actually doing it during game development but also me trying to explain it here. After all, we don’t really want simply mechanics in our games, do we? Simple is easy. Simple is stupid. Simple is boring. The opposite to be precise. The best mechanics are always simple, and it shows. Look at old Mario games: you can run in two directions and you can jump. That’s it. And it still works. Even in the newest game, Odyssey, the one big addition to this is the ability to throw your cap. Nothing more. And despite that, the game is already seen as the new Mario 64. Or look at Splatoon: On the most basic level you can shoot ink and swim in ink. That’s it. And it ended up being the most interesting and innovative shooter made in decades. But this isn’t as easy as it sounds. If simple mechanics go wrong they end up easy, or stupid, or boring. That’s how they got that stigma in the first place. And there is no fixed set of rules for this. Only some general ideas on how to do it correctly, how you will learn to just recognize it when you see it. Climbing? Just walk up to any wall and do it, no need for stupid handholds or protrusions or ivy-textures slapped on weirdly smooth walls. Fighting? No light and heavy and directional and other special moves, just one attack button. Weapons? Attack value. Durability. That’s it. No spreadsheets of stats that need to be compared. Case in point: The Hunting system, if it can even be called that. b. You just crafted the only piece of equipment that needs this animal’s parts. You will never have to hunt it again. Kinda strange how you can build one gun holster out of some lizard skin but need something entirely different for the next holster, but whatever. And we haven’t even started talking about the animals’ behavior, the stupid quick time events when predators attack you, or AC3 brilliant idea of giving you different quality loot depending on what weapons you used. Here, Animals are pretty much enemies with different behaviors, but then, most enemies differ in their behavior. They all drop different kinds of meat that can always be used for all kinds of cooking. You can find them (and consequentially, meat for cooking) nearly everywhere. Also, you don’t need to have meat to cook. Instead of unnecessary tutorials, Zelda shows you the Animals, your weapons, and cooking, and lets you figure out the rest. Most Animals behave in fitting ways, like the wolves that get scared if you kill their alpha, or the running deer, or the aggressive bears. Not only is this much simpler, it solved pretty much every problem that we just found in the classic Assassin’s Creed / Far Cry hunting system. You always gain something by hunting animals. You never have the need for one specific animal and then need to travel halfway around the world to find the latter. And the act of hunting itself, sneaking through the tall grass with bow and arrow, just feels so much better as well. You will never not need any Animal materials, because you will always use up some of them. The hunting mechanics in Assassin’s Creed 3 and 4 are results of a certain anxiety, a fear that the systems could end up boring or shallow, so more is added on top to make them look complex and interesting. Weapon-types affect the loot-quality! Use bait and traps! Animals can attack you in an epic quick time event! The problem is that in cases like this the better answer is often to reduce things, strip away layers until you are left with the most basic mechanic. And this is hard. It feels wrong, and strange, and sometimes it actually can be! But in many cases, it also leads to some incredibly good games. ICO and Shadow of the Colossus are two other classic examples that started out bigger and more complex, only to get reduced to what is necessary and are revered for that even today! It’s not like it is necessary for an open world game to have simple mechanics. There are enough other mechanics and system that work just as well. But open world games especially tend to have much more systems and mechanics than their smaller counterparts, and this can make a huge difference. This is why Zelda needs pretty much no tutorial at all, while some Assassins Creed games seem unable to ever actually end their tutorials. I know Ubisoft doesn’t want to hear this, but just layering more stuff on top of other stuff won’t actually make your games better or more interesting. At some point it can help to just strip away all those band-aids until there is nothing left but the original idea in its purest form. Again, don’t get the wrong idea. This is incredibly hard and risky, and its entirely understandable why many designers rather try a different approach. Let’s just think back to the time before Zelda: The general consensus was that for climbing to work, some handholds or other protrusions were absolutely necessary, or at least some ivy-texture slapped onto a perfectly flat wall. The idea of taking away those things, and just allowing us to climb every wall is simple but nobody saw it coming. We all were used to the status quo set by Assassins Creed and Uncharted and all these other games. We didn’t even realize that there was a way to simplify this, that there was something unnecessary to be stripped away, not until Nintendo showed us. Stamina, you have to manage it or fall to your death. Food & Cooking can be used to get more stamina or regenerate it. Equipment can lessen the amount of stamina being used. Fighting, you can jump into fight or be dropped by attacks. Gliding, you can glide at walls and start from them. And this is true for many mechanics in BotW. They all overlap each other without ever replacing each other or making the other one useless. This works so well because they are all relatively simple. Instead of being (too) complex on their own, they gain this complexity and depth by the way they interact. It’s not that mechanics have to be simple for this to happen, but it does usually make it easier. And interconnected mechanics are one of the strongest things in gaming, having all parts come together like a well oiled machine is something we see in some of the best games around. Except, most of them arent open world. Dishonored and other famous immersive sims are a perfect example as to how connected mechanics can make a game much better. At this point I have already wasted several pages on this topic and still only scratched the surface, so for anyone interested in how mechanics achieve depth (and gamedesign in general), I highly recommend reading “Designing Games: A Guide to Engineering Experiences” by Tynan Sylvester and/or “The Art of Game Design: A Book of Lenses” by Jesse Schell. Both are excellent works on the topic and helped me a lot! This is becoming probably the longest blog I have posted here until now, so I’ll try to end it here. The basic point is simple: Open world games have become entrenched in certain clichés and best practises that are simply repeated without anyone ever questioning them. BotW simply threw half of them over board and redefined all that were left. Can this easily be applied to every open world game from here on? But we can at least try to learn from this example, not by just copying everything yet again, but by taking the same risks, and daring to ask similar questions. We just learned how much farther open world games can still go. There is no reason to stop now! Of course this is mostly my opinion, so if you have found other points I missed, please add them in the comments!